Joaquin “El Chapo” Guzman Loera ranks 937 on Forbes magazine’s list of billionaires, and he has a net worth of $1 billion. The magazine calls him a symbol of Mexico’s drug war, a war that’s claimed the lives of journalists, soldiers, police officers, as well as the rank and file of rival drug cartels. This is one of the most violent periods in the country’s modern history with 12,500 lives lost this year to narco violence. With Guzman Loera celebrated, as a tycoon of sorts, what he actually comes to symbolize isn’t just Mexico’s out-of-control drug trafficking problem, but modern narco-culture. Guzman Loera, although only 5 foot 6 inches tall is a giant in his mountain village where poverty reigns. “El Chapo,” as he’s known is the head of the Sinaloa Cartel, one of the top six Mexican drug trafficking organizations working with cocaine suppliers in Colombia and battling for dominance from within the so-called Golden Triangle of narco states: Chihuahua, Durango, and Sinaloa. Since 2006 Guzman Loera has been working against, and according to many, working with the government in a drug war that was initiated in 2006 under President Felipe Calderon. According to the Mexican government, this drug war has killed over 30,000 people in the last four years. While this level of drug cartel violence hasn’t reached the U.S., the world’s largest market for illegal drugs, Guzman Loera’s product is widely distributed. The Brooklyn federal court unsealed indictments in July 2009, naming several high-level Mexican drug cartel capos including “El Chapo”, or “Shorty” Guzman Loera, in an “international cocaine distribution” conspiracy with ties to New York. Specifically mentioned in the Brooklyn indictment, which seeks a criminal forfeiture of over $4 billion, are members of the drug trafficking alliance called “La Federacion,” or “the Federation,” which included brothers Arturo and Hector Beltran-Levya (the Beltran-Leyva Organization) and Ismael “El Mayo” Zambada Garcia (a strong ally of Guzman Loera), among others. A separate indictment unsealed by the Brooklyn federal court that summer leveled similar drug trafficking charges against Vicente Carrillo Fuentes, the head of the Juarez Cartel. All of these deadly characters appear in Malcolm Beith’s “The Last Narco,” which spends a lot of time discussing the mythology of Joaquin “El Chapo” Guzman Loera, one of the mavericks of modern day Mexican narcotics trafficking. The son of an opium poppy farmer, he was raised in the hills of Badiraguato, Sinaloa. Guzman Loera moved up the ladder with a lethal hand and a personality for the type of narco-politics that helps drug cartels run smoothly, as least for a short while. 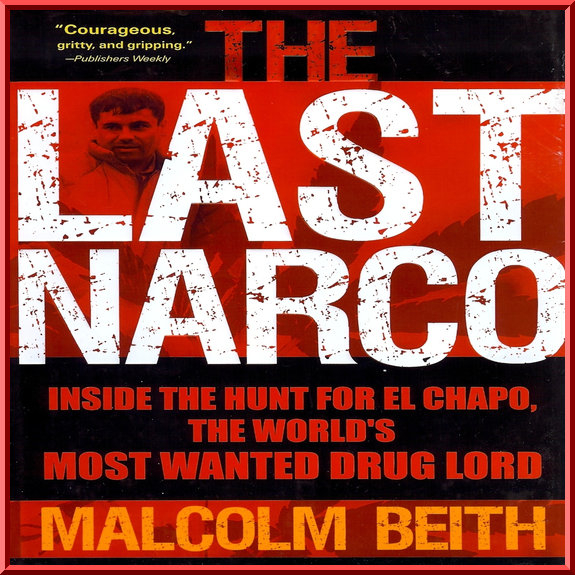 Beith spends the largest chunk of his book’s16 chapters writing about Guzman Loera’s infamous escape from a maximum security prison, which caused a nationwide manhunt that, like narco violence and drug smuggling, continues to this day. As Beith points out, Mexico is the Western hemisphere’s 5th largest nation. The allure of the money that comes from drug trafficking in Mexico is understandable in some ways due to the odds of survival under typical circumstances. The country has a population of over one-hundred-and-twelve-million people. The divide between rich and poor is sharp and according to government data nearly 50 percent of Mexicans are living in poverty. “Drugs are the only way to get ahead in Sinaloa.” Collectively, cartels have imported 200 metric tons of cocaine, according to federal documents. Of the top cartels operating in Mexico, there’s the Sinaloa Cartel, part of the Federation, the Gulf Cartel and Los Zetas who want to kill Guzman Loera and take his turf. Other cartels with extensive operations in Mexico, the U.S. and further into Latin America include the Tijuana Cartel, the Beltran-Leyva Organization, La Familia Michoacan and the Juarez Cartel, which runs the coveted Ciudad Juarez drug smuggling route. The movement of such large quantities of drugs requires greasing some palms, as corruption of police and government is another powerful force in the drug war. Guzman Loera’s escape from prison cost $2.5 million in bribes according to sources Beith interviewed. The cartel leader also had to turn on another drug organization, and he give up the Arrellano Felix Brothers who ran the Tijuana Cartel. In the end, it was as easy as jumping into a laundry basket and heading for the door. A friendly prison guard helped him escape. In 2005, while the manhunt for Guzman was still underway, he made inroads into a new area of drug sales, methamphetamine distribution. One of the strengths of the reporting is Beith’s precision with the numbers. Items he likely got from his DEA sources. “From $10,000 in chemicals, they could make $100,000 worth of meth,” he writes referring to Guzman’s overhead. On of he main points in Beith’s biography on “El Chapo” Guzman Loera, is the cycle of political corruption that facilitates the fugitive’s freedom. A few thousand dollars in the right hands and people with power look the other way. Narco politics goes hand-in-hand with police and military corruption and helps shape the future of the drug war. “I’m convinced that to stop crime, we first have to get it out of our house,” Beith quotes Mexico’s Calderon. In 2006, President Felipe Calderon took office amid allegations of electoral fraud and focused his attention on stemming the growth of narco-trafficking. Last month, when WikiLeaks released U.S. diplomatic cables, several mentioned the fear of “ ‘losing’ certain regions,” to the drug cartels, according to one document, and that the Merida Initiative, a $1.3 billion anti-drug trafficking plan backed by President Obama’s administration was lackluster.